Toby & Jenny wanted a new kitchen to not only work for them functionally, but also wanted a kitchen to reflect their understated yet unique, urban style. 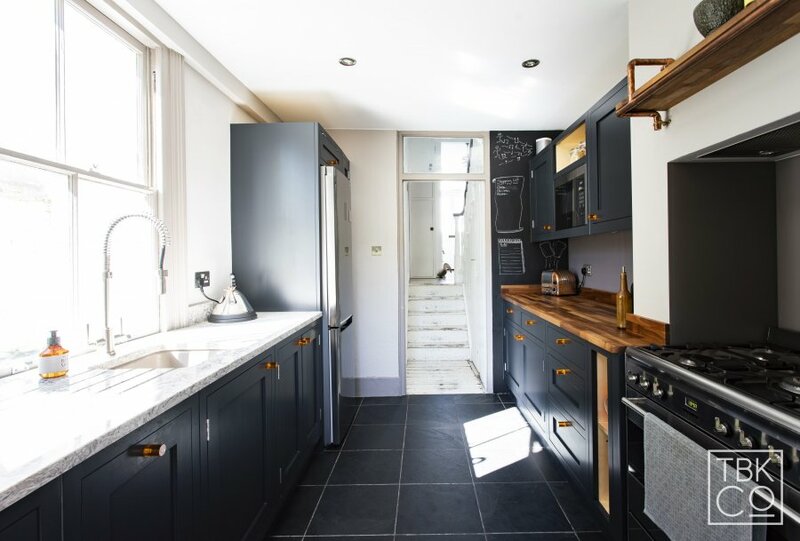 They were initially driven to change their kitchen because their freestanding units were no longer providing the best functionality or best use of space for a fully-functioning kitchen, with limited worktop space and lack of storage. 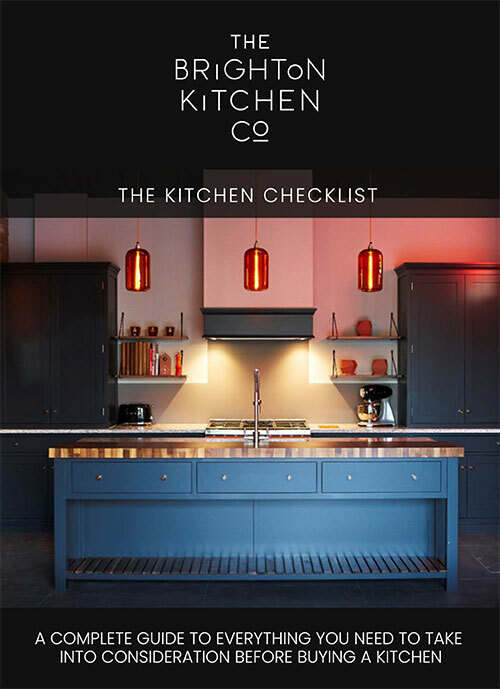 Visually, however, they wanted to avoid having too much of a ‘fitted kitchen’ feel. 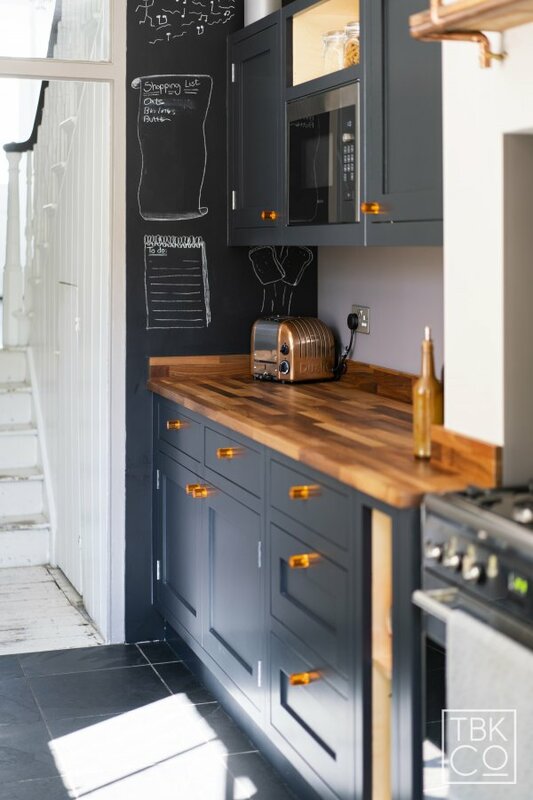 There were also a number of elements they wanted to keep, such as the flooring, range cooker and fridge/freezer, which had to be incorporated within the design. 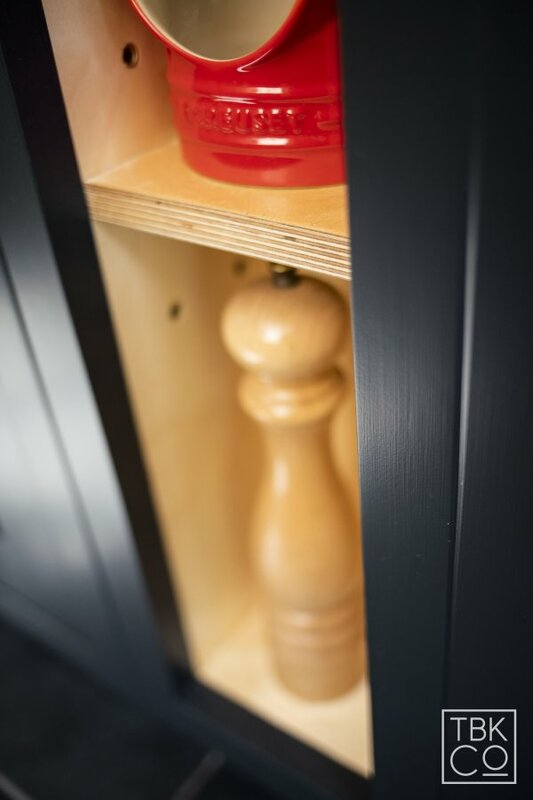 Rather than opting for standard kitchen units we chose traditionally-handmade, in-frame Shaker kitchen cabinetry with a hand-painted finish, to create more of a furniture-feel. Taking care not to fill the space with wall-to-wall cabinets, we instead opted for a combination of closed and open units to break up the run and created pockets of interesting space. This is further broken down visually with a combination of hand-painted doors against an exposed birch ply interior of the open units. To avoid the Shaker style looking too traditional, we opted for a dark paint finish with no cornice detail on the wall & tall cabinets. 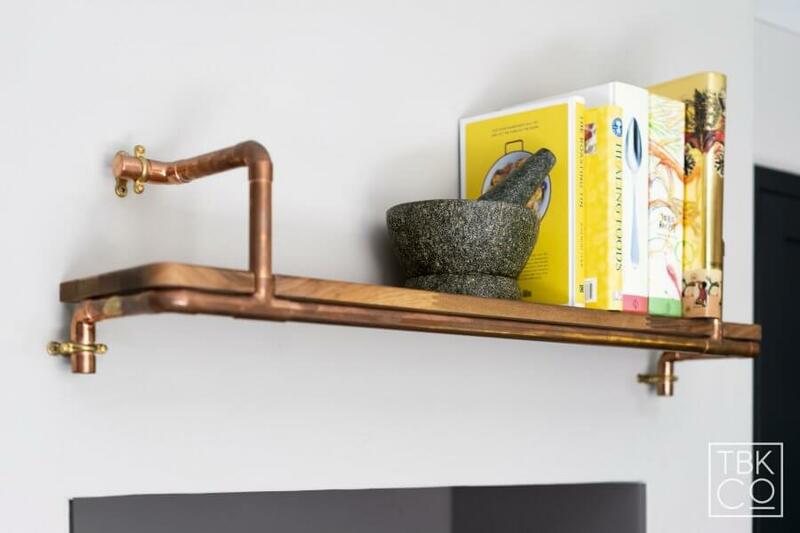 We avoided adding too many wall cabinets, instead filling the space with interesting and unique features such as the copper pipe lighting & shelving details which were all designed in-house and created by a local lamp maker. 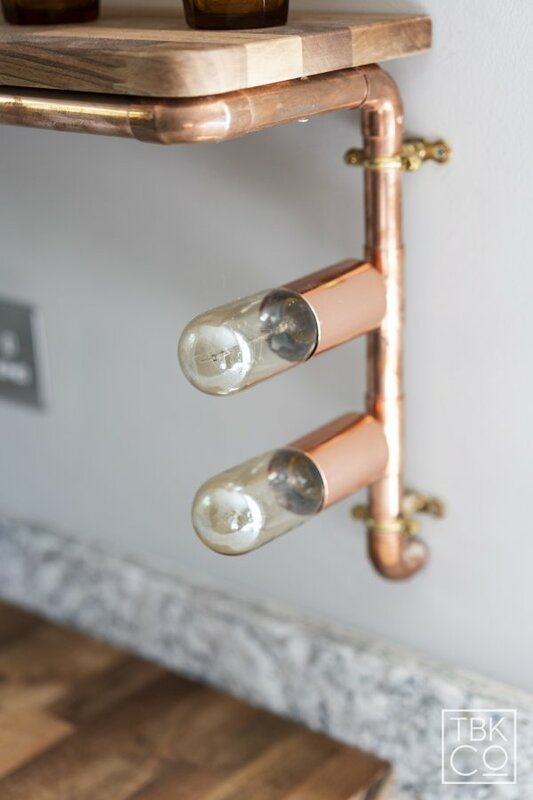 These were created completely bespoke for Toby & Jenny to add a unique, industrial touch to their kitchen. Interesting and unique details were included, right down to the handle choice. The handles, made from orange acrylic, were fabricated by bespoke, acrylic design fabricators. We made a feature of the existing appliances, by housing the fridge/freezer to make it feel more a part of the scheme. The range cooker originally stood by itself, but it is now framed with open shelving units, maximising the worktop run. A discreet extractor was built in to the chimney detail. We then framed the range with a matt glass splashback to highlight the chimney area as a feature of the room. 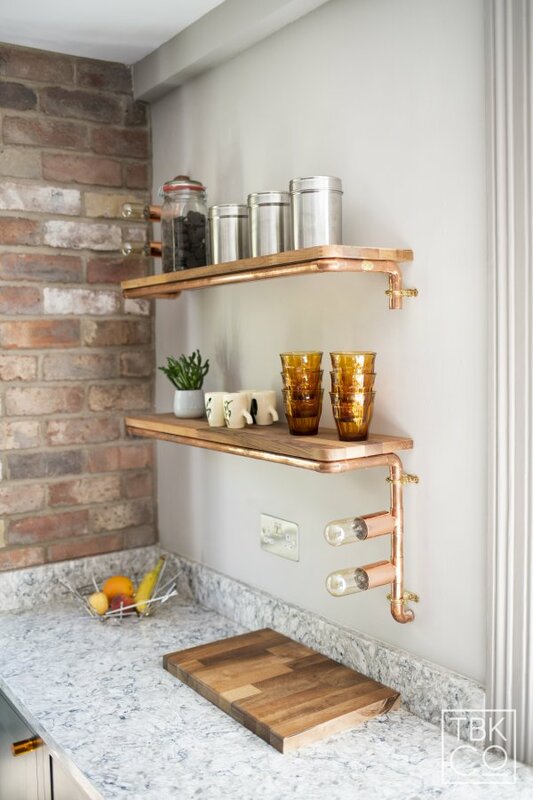 We carefully hid the boiler within a dresser-style cabinet and incorporated a microwave within the wall unit run to avoid a bulky freestanding microwave taking up useful worktop space. Layering various textures really helped add interest to this kitchen. 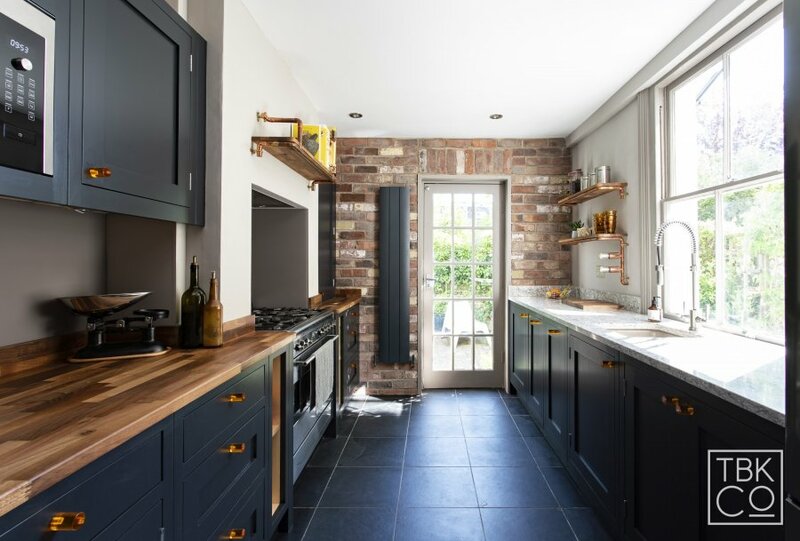 Choosing textures that complemented an urban, industrial scheme, we combined quartz and walnut for the worktop, brick tiles to create a feature brick wall effect and a combination of warm, grey browns were used for the wall and woodwork finishes. Toby & Jenny found their blackboard very useful to write down everyday reminders, so we incorporated a blackboard wall as a fun, additional feature.